Hips and the sacroiliac joints are undeniably linked; what's more it's often a chicken and egg situation. More likely the hereditary hip condition like dysplasia is the cause of the sacroiliac joint pain, but we suspect chronic SIJ subluxations can be the underlying cause of hip arthritis; it's difficult to prove, or disprove for that matter. Both of course are intrinsically part of the pelvis. Thus a condition in the hip joint itself, if it changes the gait, can immediately have a knock on effect on the sacroiliac joint. Greetings once again from Chiropractic Help. Whilst it would have been good to have started this newsletter here, Google demands I start with a few phrases on the main content of this newsletter. Issue #48, September, 2016; hips and the sacroiliac joints. should contain something no one has ever heard about." Whilst I dip regularly into the scientific literature, looking for inspiration and confirmation, and sometimes as in eggs (see below) stern dispute, the one thing you'll find regularly both at this site and in my books, written under my nom de plume Bernard Preston, is new ideas. The "frozen hip" in the young adult has long been a mystery to me; a lecture given by a prominent chiropractic radiologist on a new understanding of two confusions in the hip, the pincer and the CAM deformities, was like a bright light suddenly turned on in my brain. I say confusion because they were long called osteoarthritis; in the young adult? I remain convinced that diagnosed early, and that means being examined as, like diabetes it's a silent disease, femoro acetabular impingement syndrome need not progress unerringly to hip arthritis. But will doctors of chiropractic routinely examine their patients' hips, and will their patients accept the demand that they exercise them every single day of their lives? A short leg too affects the whole balance of the pelvis, including the hips and the sacroiliac joints. Interesting research by radiologists show conclusively that a short leg leads on to early arthritis of both the hip and knee. Two things are at first glance bizarre; the first is that the arthritis is not necessarily in the long or the short leg, and the second is that there is no consensus over what constitutes a short leg; 3mm, 5mm, 10mm, more than 15mm? What is certain is that folk with a significantly short leg have difficulty standing for long periods, as at a cocktail party, and strolling at a slow pace through the park or whilst window shopping. Normally speaking there is a fixation on the side opposite the short leg, or you might say on the long leg side; however, this is not necessarily so. Other factors come into play; for example the shape of the scoliosis associated with the short leg, trauma such as falling on the buttocks from a horse, or on ice, and the presence of anomalies at the lumbo-sacral joint and in the hip itself. We feel it is this sacroiliac fixation that often determines whether you are in pain, or not, rather than which leg is short, and whether this arthritis develops in your hip and knee; and the lumbar spine too, for that matter. Frankly it's a can of worms that needs the attention of the researchers in the field. For example, what proportion of folk randomly chosen who are found to have a demonstrable sacroiliac joint fixation actually have pain, or stiffness, or other symptoms? The hip is in addition subject to various anomalies, one of which is the femoro acetabular impingement syndrome; it comes in two forms, further muddying the water, as it affects the movements of the hip in different ways; thus the effect on the SIJ differs. FAIS as it is known, affects the movements of the ball in the socket, and has a profound knock on effect on the sacroiliac joints. Reduced flexion, adduction and internal rotation are the common features; this may be severe is certain cases, mimicking hip arthritis, which it isn't. In short, hips and the sacroiliac joints are intimately connected causing headaches for your chiropractor; pain in the groin, side of the hip, buttock and sacroiliac joints, often radiating down the front or side of the leg are common features; and it all begins with the young adult, but doesn't usually surface until later. Thus meralgia paresthetica also needs to be considered; that's an impingement of the lateral femoral cutaneous nerve in the groin, producing not dissimilar numbness and pain in the leg. Mrs B, a 53 year old woman, presented at the chiropractic coalface with severe, debilitating right hip, groin and sacroiliac joint pain. Hip flexion, adduction, internal rotation, and the Patrick's Faber test were all limited and painful. The adductor magnus muscle and the hip capsule were extremely tender on palpation, but the area under the inguinal ligament where the lateral femoral cutaneous nerve exits from the pelvis was not tender; nor was there any sensory change on the side of the thigh; conclusion, this is not meralgia paresthetica. 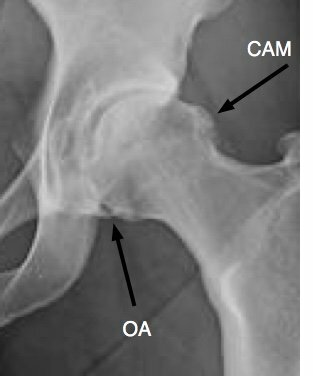 X-rays revealed pincers in both hips, confirming the diagnosis of femoro acetabular impingement syndrome. An interesting thought arises; although the pincer in the right hip is distinctly larger than the left, why are there minimal symptoms in the left hip? Could it be that they are what is known as an incidental finding; something that's true but of no great consequence? Clearly more research needs to be done on hips and the sacroiliac joints. Notice too that an orthotic in the right shoe would balance up the pelvis but, in this situation, would increase the lumbar scoliosis. The treatment of femoro acetabular impingement syndrome remains controversial; surgeons like to remove the spurs. Chiropractors look to mobilising the hip and adjusting the sacroiliac joints, and deep soft tissue work in and around the hip. Neither constitute a cure; the pincers grow back and continued management of the hips and the sacroiliac joints remains important for chiropractors; otherwise the pain comes right back. I adjusted this lady's sacrum and ilium, mobilised the hip and did deep, painful soft tissue work in and around the hip joint. After the first treatment she felt 20% relief of pain, after the second 70%; in other words significant immediate relief. But it's not a cure and ongoing care, both by the patient who must exercise daily and the chiropractor who must keep his wits about him are essential. I anticipate that she'll need a treatment once every four to six weeks; say about ten treatments a year which will keep the condition under control. Conceptually it's little different to the management of incurable medical conditions like diabetes, for example; the patient has to take responsibility for home care of his or her condition. In another casefile, this 60 year old lady has had severe right hip and groin pain for over a year. She made no mention of her left hip where there is early arthritis. Can you see the pincer and CAM deformities arrowed in the right hip? In the left hip there is also a pincer, and loss of medial joint space; these are the precursors to hip arthritis. See the double arrows below. Mobilising the hips every single day to keep the synovial fluid sloshing about and supplying the joint cartilage with nutrients and oxygen is vital; it's your responsibility; otherwise there'll be two hip replacements on the cards within ten years, and perhaps a lot sooner. Notice too the bogey short leg contributing to her pain and the arthritis that is developing. Much of her pain is in the hips and sacroiliac joints; there really is no need for you to suffer in silence. She too will have to exercise these hips and her SIJ every single day and consult her chiropractor occasionally but regularly. She can expect 60-90% relief of pain and more important far less disability; raising her knee to get into the car for example will be much easier. The deep soft tissue treatment of the hip capsule and the surrounding muscles is very painful, but lasts only a moment. After only two treatments she is showing significant improvement. What is perhaps odd is that her arthritic left hip (confirmed by the radiologist) is giving her little pain, but some stiffness on examination. It's the right hip with its pincer and CAM deformities, and the sacroiliac fixation that is causing her pain. In short, hips and the sacroiliac joints are inseparable; as soon as there is a finding in one, the other should also be examined. This runner had sudden onset of acute pain whilst running three months ago. Two x-rays and an MRI agreed that it was hip arthritis. There certainly is some arthritis, low in the joint and some loss of joint space superiorally; however it's early stuff. There is no roughening of the cortex above in the head or cup, nor is there any cyst formation. 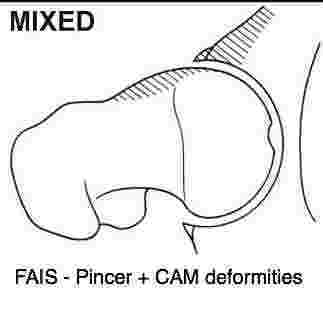 What is interesting though is the simply huge CAM deformity; this is femoro acetabular impingement syndrome, a very treatable but incurable condition. This is not a patient of mine, so I'm unable to confirm this is a hips and the sacroiliac joints case; but I suspect it is. The sudden onset suggests that it will respond to treatment, but it's on the verge of becoming chronic. Do your level best not to allow any condition of the body to continue to the six months stage; then you'll almost certainly have it for life. All three of these cases are likely to be inflamed. What's needed is not anti inflammatory drugs but a change of diet to include those foods that are anti inflammatory in nature, like olive oil, fatty fish and freshly ground flax seed, for example. They won't give you a hole in the stomach like NSAIDs do. Are eggs and bacon, and eggs Florentine to be weighed equally? Eggs are an excellent source of protein, and the most prolific source of vitamin B12; a deficiency causes a fatal disease called pernicious anaemia. Yet eggs in the diet remain controversial. For years we've been told they raise your cholesterol, and even though it's now been disproved, doubt continues. More significant, how you enjoy your eggs makes a huge difference. Of great concern is that research following 27,000 men for 14 years found that those who ate 2.5 eggs a week, or more, were 81% more likely to get prostate cancer. But, they made no distinction how these men enjoyed their eggs. Fried eggs and bacon on white toast with margarine? Poached eggs Florentine on a bed of spinach, on 100% wholemeal toast and butter? By far the majority of those men would have followed meal plan 1. Only the health nuts would have followed plan 2. Yet both would have contributed equally to the research. I'm still happy to recommend egg Florentine, rich in a proven anti cancer carotenoid called epoxyxanthophyll in the spinach, every day. Bacon on the other hand has now been unequivocally proved to cause cancer; it could well have been the source of the prostate cancer, rather than the eggs. Enjoy an egg regularly, but keep bacon for high and holy days. Especially look for true free range eggs; if pain is your constant companion, the anti inflammatory omega-3 in free range eggs is worth the extra cost. I do hope that many of you are readers, and not just of blogs like this. I've just finished Little Bee, and it comes highly recommended. A lovely story, you'll enjoy and be stretched like I was. Bizarre but it costs $ 12.99 on your Kindle, but only $ 4.93 for the book on Amazon! Ebooks are not always cheaper; buyer beware. library three days a week for 10 years." - Ray Bradbury, one very popular writer. If you haven't read my Stones in my Clog, only available as an ebook for $ 4.00 then you're missing something special! Bernard Preston's experiences as a chiropractor practising in the polders of Holland; totally original thoughts that you've never heard about on every page. Enjoy!